Wow them with your countertops! Our professional countertop care services include cleaning and sanitizing, honing and polishing, repairs and restoration, sealing and protection, and more. The great thing about natural stone countertops is that damage can be erased, restoring the like new elegance of your stone. Heavy use can cause the appearance of marble, travertine, slate, granite, and other natural stone to dull. Chips, scratches, and other damage can occur. If this is true of your countertops, you can breathe a sigh of relief because you most likely don't need to replace your countertops. Our expert technicians have the knowledge and experience to resolve a host of problems from etching and lippage (uneven tiles) to repairing cracks and holes to applying regular or color-enhancing sealers. If you have a matte/honed finish that you want to be shiny—or vice versa—we can change any finish to what you have in mind. If you have dirty tile and grout countertops, our professional tile and grout deep cleaning and sealing or color sealing services can achieve dramatic results that regular cleaning methods or janitorial services can't. Our deep cleaning methods and solutions extract dirt and grime, restoring your tile and grout to a like new condition. Then we can apply a clear or color sealer to inhibit staining and make regular cleaning more productive. 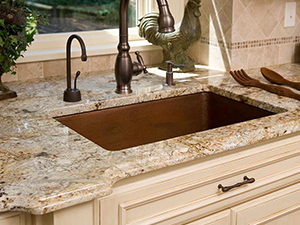 For countertops, we highly recommend color sealer, because it has constant-acting mildewcides and fungicides to a more sanitary food-prep surface. Trust your countertops to the professionals at CEI Surface PROS. We guarantee dramatic results. Contact us online or call (239) 455-1167 for a FREE estimate on any of our professional countertop care services throughout throughout South Florida – Port Charlotte, Ft. Myers, and Naples. We will travel up as far as Sarasota.